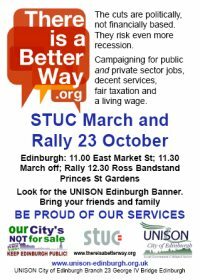 There is Better Way and UNISON is urging all members to turn out on 23 October – in Edinburgh – for a national demonstration for decent public services, public and private sector jobs, fair taxation and a living wage. 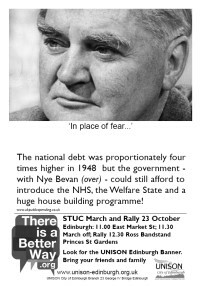 The cuts are politically, not financially based. They risk even more recession.